Everyone has their own perceptive of what is beautiful and what is ugly. 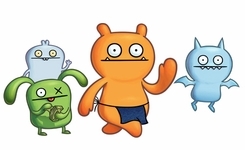 Uglydolls help adults and children express who they are through emotions and feelings. These dolls are therapeutic and can help kids with problems express how they feel, release inner tensions and deal with frustrations. The characteristic of each doll is described as human behaviors or human tendencies. People go through a series of emotions each day. One minute they are happy and care free and the next minute they are fearful, sad, lonely or depressed. Ugly dolls are unique they are actually saying this is how I look on the outside but this is not who I am on the outside. Uglydolls are plushy, soft and irresistible. One particular ugly doll is name “Wage” and he is works at the local grocery store. Despite his hard work and efforts he still remains invisible to his employers. However, he remains positive and upbeat. His enthusiasm does not allow him to ignore other people who are lonely or sad to cross his path without saying a few encouraging words. Workers can take a lesson from “Wage” and learn to accept who they are and be comfortable with what they do. There are hundreds of dolls just like wage that actually touches on how people feel in real situations. Unlike individuals Ugly dolls are not afraid to openly express how they feel. Kram Scrammy is an ugly doll that loves knowledge. Remember the saying, “The more you know the farther you go”? Well, Scrammy really believes this. He is thirsty for information and knowledge of any kind. His curiosity can be a problem at times but to quieted him down just take him to the nearest old fashion telephone booth. Just do not give him a beeper! Most Ugly dolls are recommended for children of all ages. They inspire and enhance creativity. They have won the Parents Best Choice Awards and they are collectible, huggable, and entertaining.